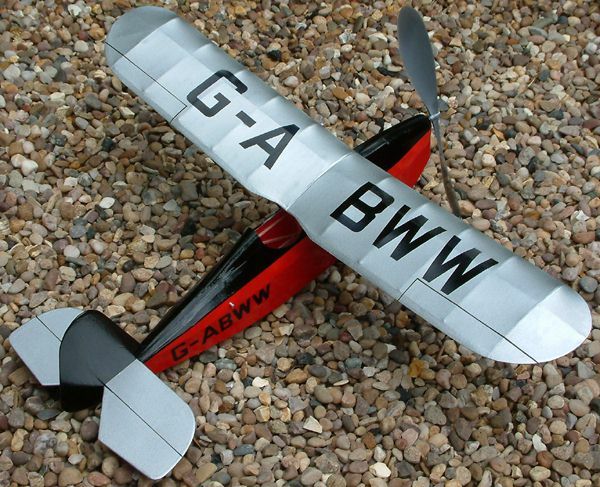 It has been great to hear from people all over the world who have been building Veron Comper Swifts, and I thought it would be nice to have a gallery here to show off the models. So, please send me your photos and I will add them here. 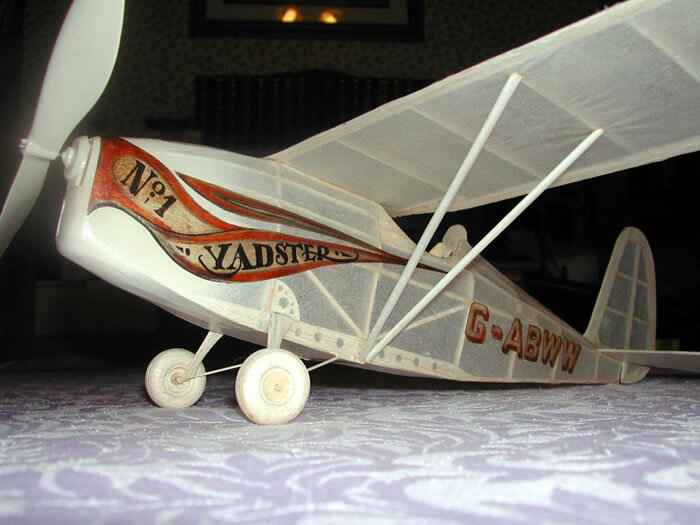 I find it amazing that Alasdair Deas has produced such an immaculately built and finished model at only his third attempt, but that is what he did. Isn't it a beauty? 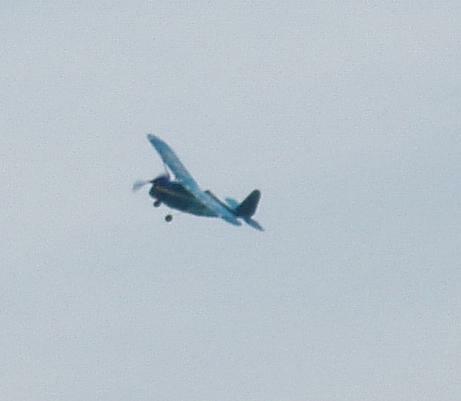 Alasdair copied Chris Strachan's nose block idea (sensible chap) and has fitted a Peck 7 inch prop. 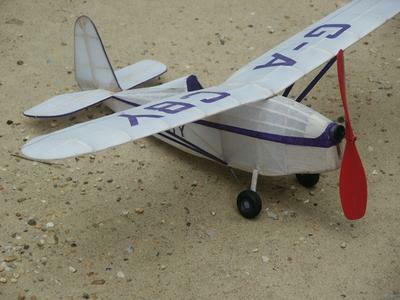 Weight without rubber is around 20 grams, which bodes very well for its flight performance. The model is covered in Esaki tissue and sprayed (very neatly) with enamel thinned with dope thinners. 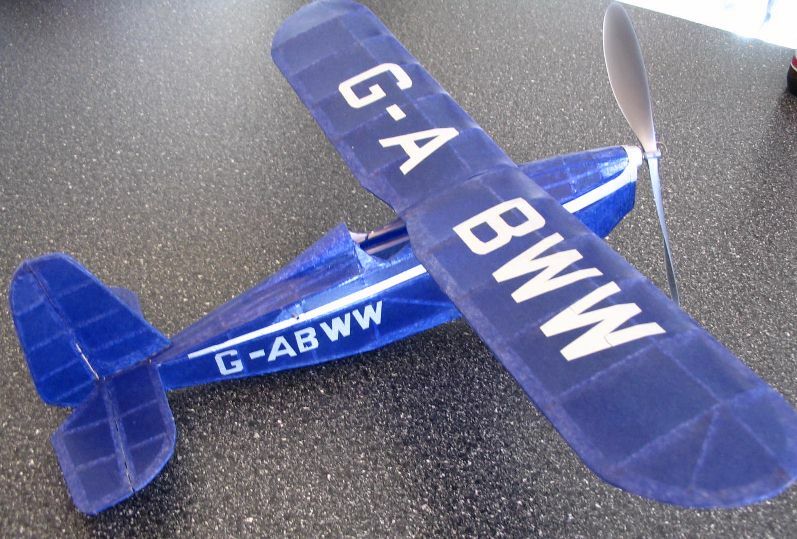 The wing registration was masked and sprayed, and the fuselage lettering done by cutting out painted waterslide decal film. The colour scheme was found on a peanut scale plan during an internet search, and I think it looks very smart. Here is Reese Otts' Swift finished as VH-ACG, as illustrated in appendix 1. The lettering is all done using ink jet printed tissue. Miyasaka Mitunori sent me these pictures all the way from Otsu City in Japan showing his Comper Swift, which he built using the plan and information here on the site. 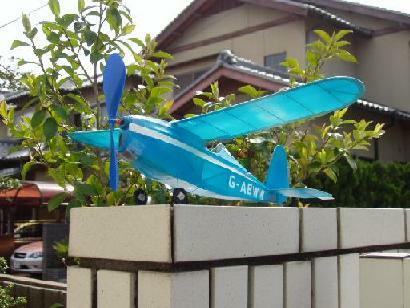 He says he only understood half the English, but despite this has finished the model and successfully flown it, as you can see in the photo below, so congratulations are in order! 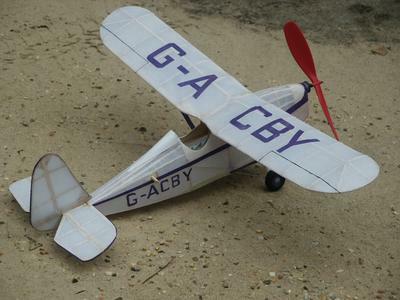 Vince Loustalot from New Orleans, USA finished his Swift as G-ACBY using white and purple domestic tissue. Very nice it looks too. 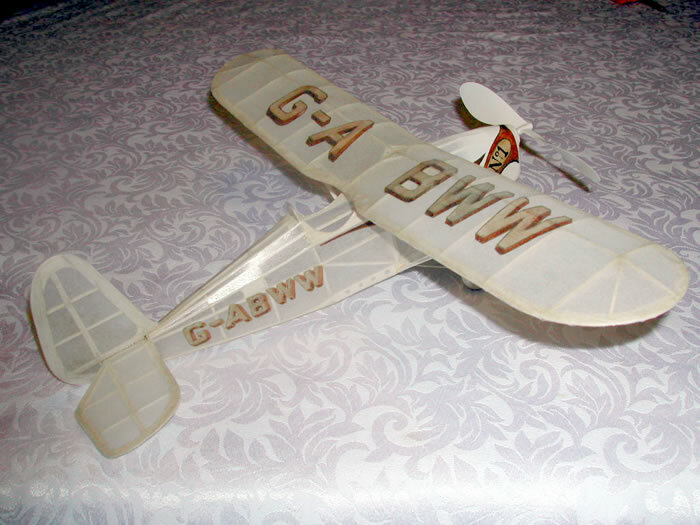 The tail surfaces were lightened using smaller wood sizes in the tailplane, and a built-up fin. Rudder and elevators are hinged, so adjustable. 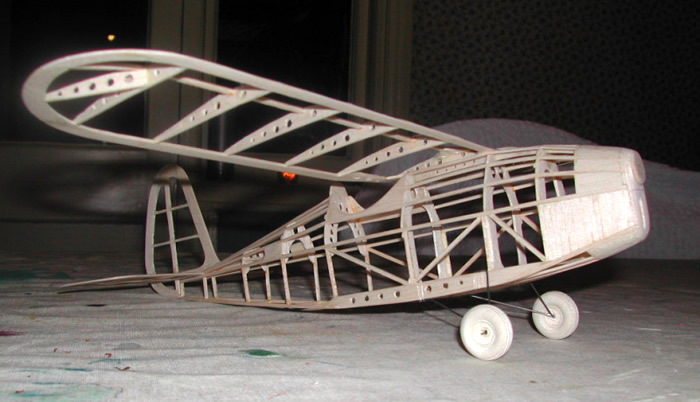 The wheels are from laminated balsa as shown in the construction article. I am delighted to say that the Vince found the model easy to trim, and has it flying to the right on a loop of 1/8" rubber. He says,"What a friendly little ship. The Swift could spoil a person easily. 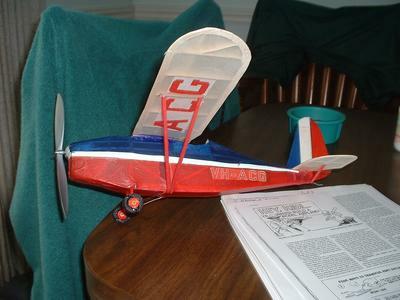 I have built 5 models now that I am back in the hobby and the Swift was the easiest to trim and fly". These are words I am glad to hear! Thanks to Rolf Christophersen for sending me not only a picture of his finished Comper Swift, but also notes and photos of some tools and techniques he used to make it. You can see from the photo above what a nice clean job he has made of it. This is Rolf's excellent jig for measuring the balance point exactly - certainly beats finger tips! 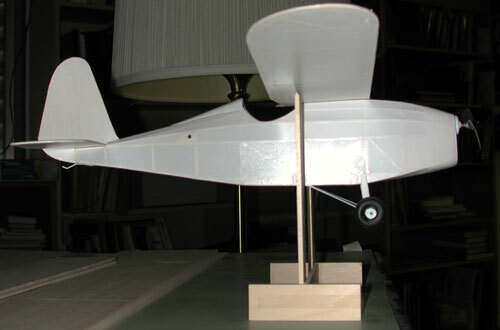 Lead was added to the nose until the balance point moved to directly under the wing spar. 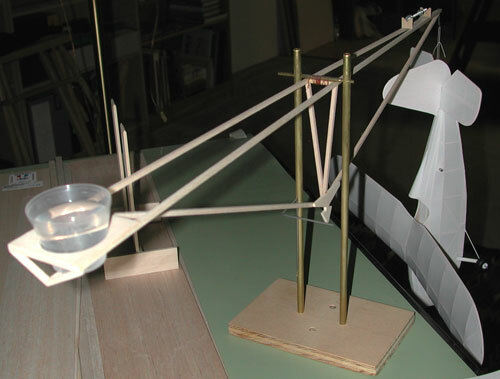 "About two or three years ago, Doug Foster, a New Zealand teacher, sent me this balance beam design. I use an eye dropper and count the number of water drops per gram. I got the gram weight at the chemistry department of one of the local colleges. This eye dropper gives 26 drops per gram. The weight was 22.6 grams without nose weight, motor, or markings. I haven't figured the all up weight but think it will be about 24g." "I copied your sanding block- works great. The alignment tool gets the axle perpendicular to the wheel after lamination (I made the hole with a drill press and then bushed it so I could take the wires out). I leave the axle long so I can put it in the drill's chuck and sand for detail. I cut and sharpened these metal tubes to cut the rim laminations. They press out nicely. 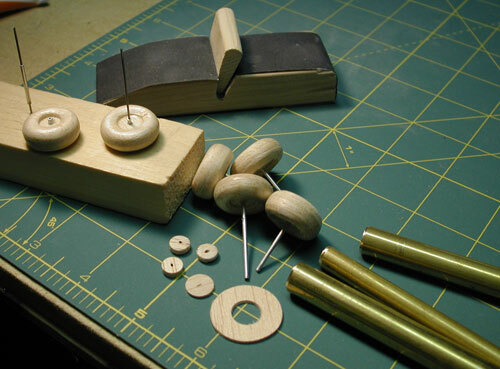 When the wheels are ready for finishing and painting I put them back on the tool for painting and drying." Some excellent tools and tips there - thanks again Rolf. 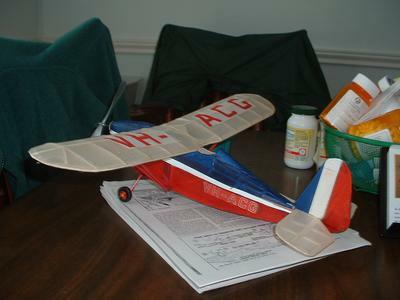 The model has not flown yet, but as soon as I hear how it goes I will pass it on. And now for something a little different! 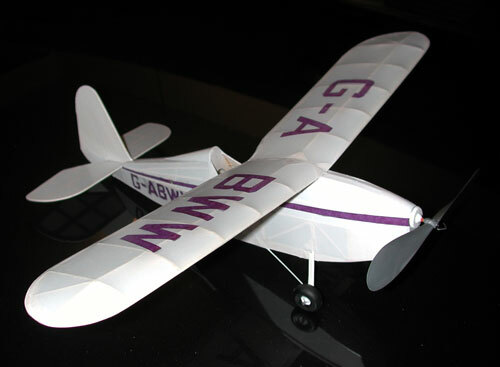 This model is the work of Andi Michaelsmith, and believe it or not, it his first attempt at a balsa and tissue flying model! Did any of us cover our first model this well? I think not! Just look at that framework! The quality of the workmanship and attention to detail is amazing. 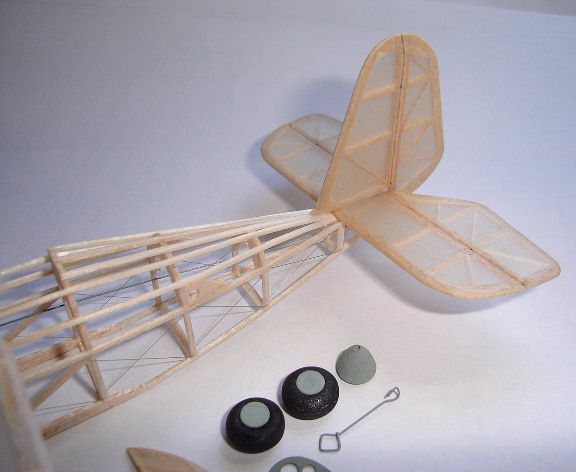 I was particularly impressed with all the lightening holes and those beautiful balsa wheels. Andi has approached the finishing with an artist's eye, and rather than going for an accurate colour scheme, decided to use his imagination. You can see for yourselves how impressive the result is. I am looking forwards to hearing how this one flies! This nicely finished example is the work of Kirk Binns, from Dartmouth, Nova Scotia in Canada. The finish is Dare domestic tissue finished with two coats of clear Krylon. Kirk says he thinks the final all-up weight of 26 grams is a bit on the heavy side, but the model flies successfully using a 7 inch Peck prop and a 12 inch loop of 1/8" FAI Tan rubber. 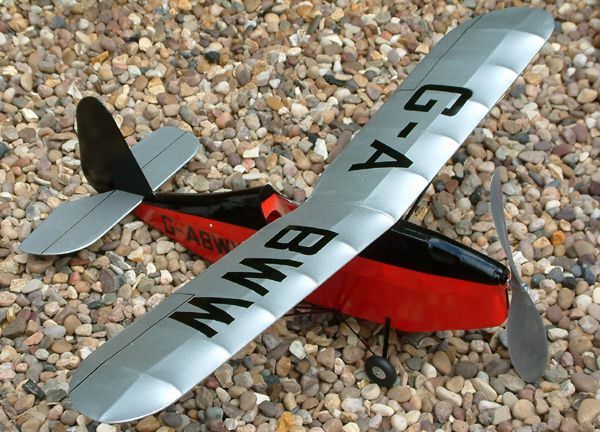 Gareth Powell decided that the Veron design was just too big, so is building a half size version with a wing span of just 9 inches. Just compare to the size of the match in the picture! 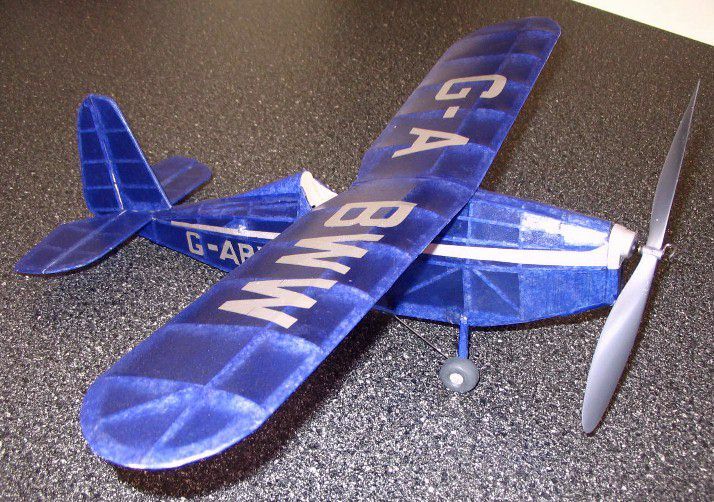 This fantastically delicate model features such details as additional half ribs, drilled and lightened ribs, movable tail surfaces, ailerons and internal rigging. The model will be covered it with condenser paper and Gareth's best projected weight estimate so far is 1.98 grams total (ex rubber and prop) so he has high hopes of it flying. 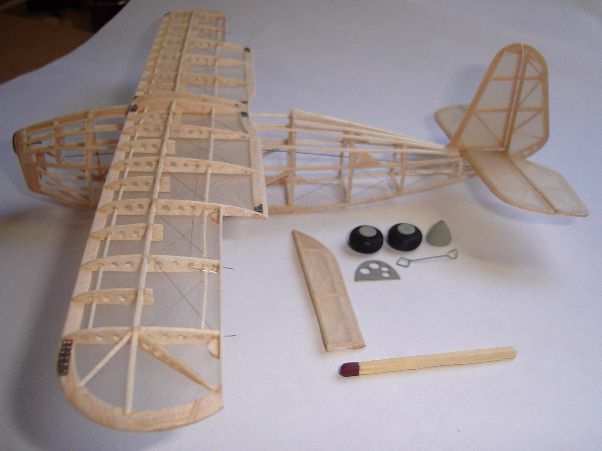 You are currently on appendix 4 of "Build your first flying scale model"